alaTest has collected and analyzed 45 reviews of Samsung 55Q6FN / 55Q6F (2018) Series. The average rating for this product is 4.8/5, compared to an average rating of 4.3/5 for other products in the same category for all reviews. People are impressed by the sound. The image quality also gets good comments. We analyzed user and expert ratings, product age and more factors. 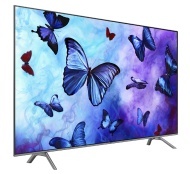 Compared to other products in the same category the Samsung 55Q6FN / 55Q6F (2018) Series is awarded an overall alaScore™ of 89/100 = Very good quality. The Samsung QE55Q6FN has an excellent picture that after some tweaking gives a vibrant 4K picture and handles 1080p very well. This TV I bought last week gives me the best picture quality I have ever had. Absolutely stunning . Got this TV just after Xmas and I'm happy I did. Came with a free 4k blu ray player. The image quality is amazing and the sound quality is so much better than I thought it would be.